Royal palaces, lush gardens and the Louvre - this is just a taste of what the 1st arrondissement has to offer. Stylish and grand, soak up Parisian history while being surrounded by opulent beauty. Once the haunt of France’s kings and emperors, the 1st arrondissement is the royal heart of Paris. Strolling along the formal Tuileries Gardens, it’s hard not to be swept away by the pomp and grandeur of the sumptuous palaces. This regal setting is home to the Musée du Louvre, the largest museum in the world. 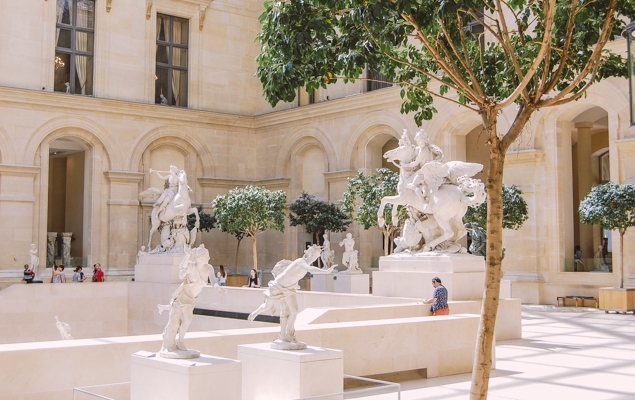 The 1st arrondissement in a dream location in Paris for art lovers, who will want to return again and again to discover the wealth of art on display at the Louvre. Nearby you can visit the Musée des Arts Décoratifs dedicated to design and decorative arts or be spellbound by Monet’s peaceful water lily series at the at Musée de l’Orangerie. 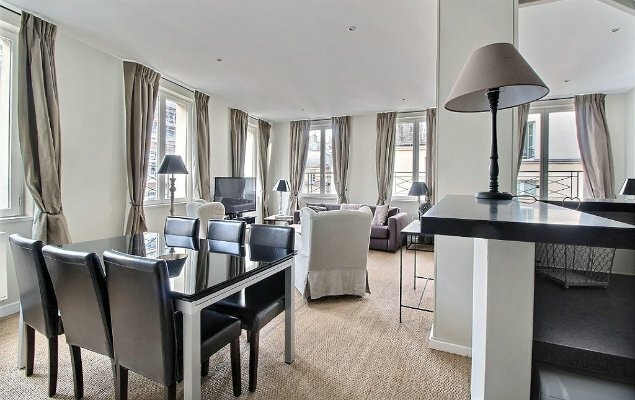 Our Musigny Paris apartment rental is located nearby; guests love the location and apartment. Centrally located and convenient to many of Paris’ top sights, it’s just a short walk along the Seine River to the tip of the pretty Ile de la Cité island, which is part of the 1st arrondissement. There you’ll discover the soaring Gothic masterpiece of the Notre Dame Cathedral and the shimmering stained glass splendor of Sainte Chapelle. 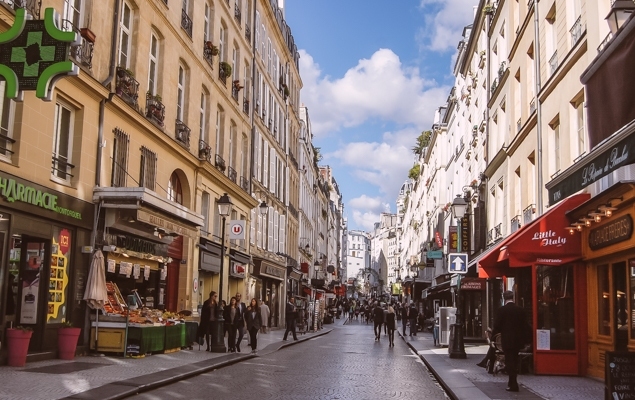 The 1st arrondissement is a heavenly spot for shoppers, who will swoon over the elegant shops along the rue de Rivoli and love exploring the trendy boutiques in the Les Halles neighborhood. Enjoy the lively street scene at the rue Montorgueil open air market, where you’ll find everything you need for a wonderful meal at your Paris Perfect apartment. This neighborhood is filled with inviting cafés and restaurants, ideal for taking a shopping break to enjoy a moment of Parisian daily life. 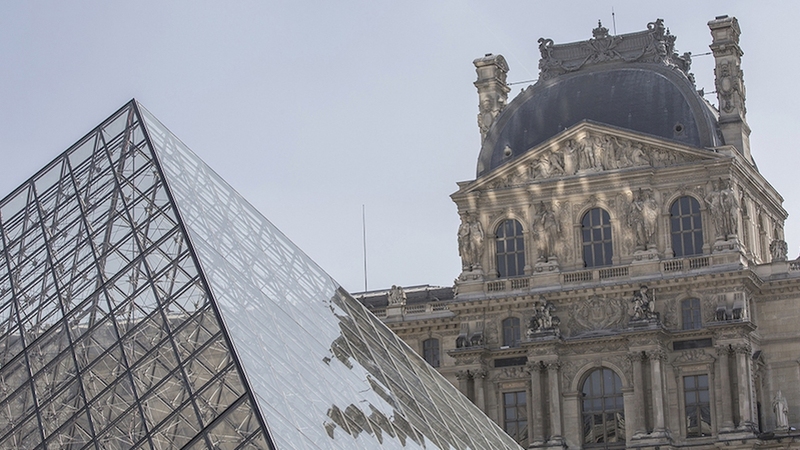 There is simply no other museum in the world that compares to the Musée du Louvre. To say that it’s the world’s largest and most important museum doesn’t begin to describe what you’ll discover inside. Walking along the Jardin des Tuileries is one of the best ways to approach the Renaissance-style royal palaces that are now home to the Louvre Museum. The buildings are aglow at sunset. In this evocative setting, it’s easy to imagine the royal carriage of Marie Antoinette or the Sun King passing by. With the crunch of the little stones under your step, you can almost hear the sounds the carriages clattering over the cobblestones into the grand courtyard. Enter the Louvre through the gorgeous glass Pyramid Entrance designed by the famous architect I.M. Pei. Opened to a great deal of controversy in 1989, the entrance is now a popular and modern contrast to the refined architecture of the Louvre. Once inside, there’s a wealth of art for you to discover. 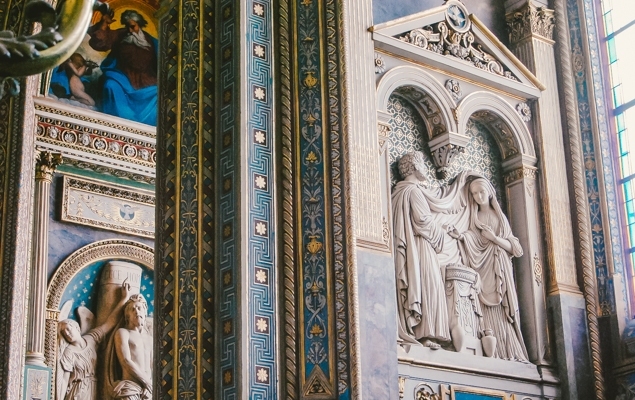 With more on display at the Louvre than you could see in a lifetime, many first time visitors focus on seeing the masterpieces like Leonardo da Vinci’s Mona Lisa, the timeless beauty of the Venus de Milo, the Winged Victory of Samothrace and Vermeer’s quietly beautiful painting of The Lacemaker. Or pick your favorite artistic period and explore the extensive collections in more depth. Art lovers will having fun exploring galleries and then coming back to discover more of the dazzling art on display at the Louvre. Just below the grand courtyard is the Carrousel du Louvre, one of the most popular shopping centers in Paris. Here you’ll find a great selection of boutiques dedicated to home design and larger stores such as Esprit, Virgin Megastore, Paris’ first Apple Store, Swarovski and many others. Located in a the Louvre Museum’s western wing, the Musée des Arts Décoratifs is a wonderful museum dedicated to decorative arts and design. 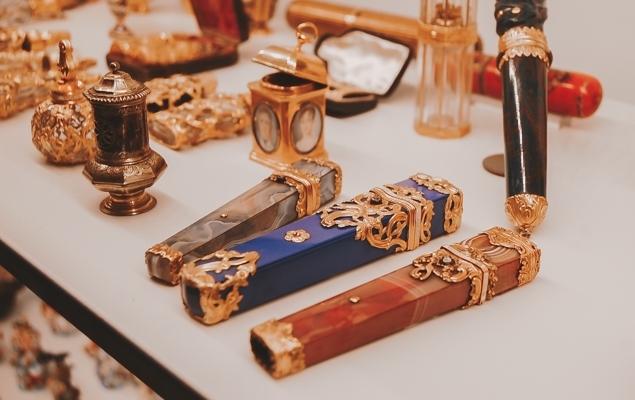 The collections are so vast that the museum is able to present an overview of decorative arts from the Middle Ages to present day through displays of furniture, religious paintings and altar pieces, wallpaper, ceramics and even toys. Explore the collection chronologically, or head to your favorite period in design history. The Art Nouveau and Art Deco rooms are one of the highlights of the collection. Part of Les Arts Décoratifs, the Musée de la Mode et du Textile (Museum of Fashion and Textiles) celebrates Paris’ great fashion tradition with a fabulous collection of costumes, fashion accessories and textiles that tell the history of costume from the Regency period to the modern day with works by top designers. For an escape from busy city streets, step through the gates to the Palais Royal, or Royal Palace, and you’ll feel transported back to the 17th century. Today the Palais Royal is home to the French Ministry of Culture. Best of all, you can visit the beautiful and peaceful Jardin du Palais Royal surrounded by arcaded buildings lined with original boutiques, restaurants and art galleries. Locals know about this quiet spot, and you’ll find the more intimate scale and private feeling of the gardens a welcoming respite after a busy day of museum visits and shopping. For a modern view of Palais Royal, walk through Colonnes de Buren designed by the French conceptual artist Daniel Buren. His work features black and white marble columns of different sizes spread across the southern end of the gardens. This bizarre addition to the elegant Palais Royal Gardens was one of the works of France’s President Francois Mitterrand in the 1980s when he wanted to establish new monuments in Paris. While they’ve always been controversial, the contrast between old and new, delicate and severe is amazing. The arcades surrounding the gardens are one of the 1st arrondissement’s nicest areas to shop. 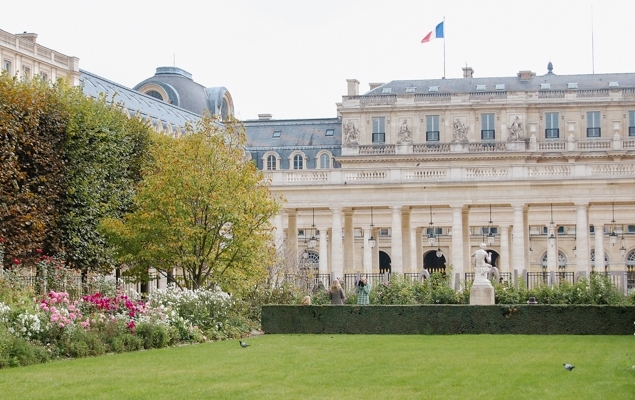 Enjoy window shopping and stopping in unique stores as you stroll around the Jardin du Palais Royal. One boutique you won’t want to miss is the arcades is Didier Ludot where you’ll find an amazing and tempting selection of vintage Parisian couture. One of our favorite stores are the vintage clothing stores, Dider Ludot. From ‘the little black dress’ by Chanel to Christian Lacroix, Yves St. Laurent, Hermes and more. France’s national theater, the Comédie Francaise, is located in the Palais Royal. The theater presents classic works by Molière, Racine, Shakespeare and many others, as well as works by modern playwrights. From visiting royal palaces, world class museums, Gothic architectural gems, strolling along the rue de Montorgueil open air market to seeing the outrageous Pompidou Center, the 1st arrondissement offers a wonderfully varied choice of museums and historic sights to discover. Once the royal tennis court, the Galerie Nationale du Jeu de Paume was turned into an exhibition space that hosted an Impressionist museum before the collection moved to the Musée d’Orsay in 1986. Located in the Jardindes Tuileries overlooking the grand Place de la Concorde, the Jeu de Paume now hosts exhibitions of contemporary art. The Gothic Church of St-Eustache, one of Paris’ most beautiful churches, is located near the entrance to Les Halles and marks the beginning of the famous rue Montorgueil open air market, which covers two entire streets. Shopping along these market streets is one of the highlights of staying in the 1st arrondissement. The neighborhood surrounding the Church of St-Eustache is a charming contrast of ancient, historic and modern with boutiques, outdoor cafés, restaurants and one of kind food shops. Musigny, our beautiful 3 bedroom Paris apartment rental is only four minutes walk from the Montorgeuil market street. A unique tiered 12th-century bell tower soars above the Church of St-Germain l’Auxerrois, one of the Gothic architectural masterpieces of Paris. The church was redone in the Gothic style in the 15th century, and later served as the church for the Louvre when it was a royal palace. The square outside the church is remembered as the site of the grizzly St. Bartholomew’s Day Massacre on August 24, 1572 when thousands of Protestant Huguenots were killed as the bell of St-Germain l’Auxerrois tolled. Home to Claude Monet’s masterpiece water lily series called Nymphéas, the Musée de l’Orangerie is one of Paris’ artistic gems. Stand in the center of the grand oval gallery where you’ll be surrounded by the enchanting flow from blues to greens in his over sized water lily paintings. Feel the tensions of daily life melt away as you’re transported to Monet’s garden home in Giverny where the artist created this impressive series. In its light-filled galleries, the Musée de l’Orangerie also displays an excellent collection of works of modern art by Cézanne, Renoir, Picasso and Modigliani. Located right in the Jardin des Tuileries, the intimate Musée de l’Orangerie is a lovely break during your stroll through the gardens. Architecture in Paris doesn’t get more outrageous or fun than Richard Rogers unusual Pompidou Center. Opened in 1977, the Pompidou Center’s high tech architectural style makes the building seem as if it was turned inside out, with the structural support, elevators and escalators all located on the outside of the building. Despite the controversy about its unusual design, the Pompidou Center is one of the most popular attractions in Paris. It is home to the Musée National d’Art Moderne, one of the best collections of modern art in the world. Located in the 4th arrondissement, the Centre Pompidou is only a short stroll from Les Halles and the 1st arrondissement. Strolling through the formal gardens and the grand squares in Paris you’ll find yourself immersed in daily life in Paris and surrounded by generations of Parisians. 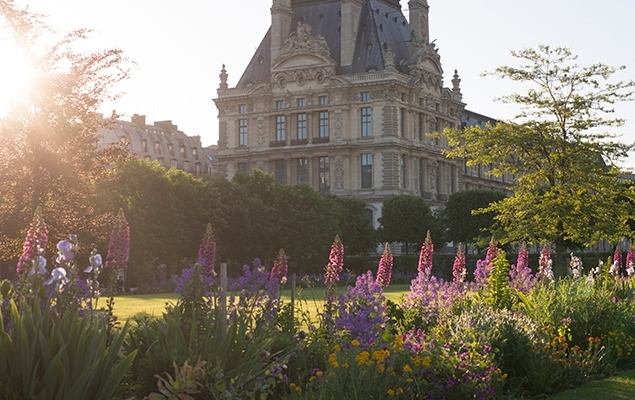 The 1st arrondissement has some of the largest and most beautiful gardens in Paris to explore. Stop by one of the many outdoor markets and put together a delicious picnic before heading to the garden for a moment of peace and relaxation in the center of Paris. Located along the Right Bank of the Seine River between the Place de la Concorde and the Louvre Museum, the Jardin des Tuileries is one of the most elegant gardens in Paris. It is also one of the loveliest places to relax and enjoy Parisian life while strolling along the gravel pathways. Visit the Tuileries Gardens on a sunny day and you’ll find children playing with toy boats in one of the fountains and Parisians out enjoying life. Bring a picnic and find a spot where you can see the Eiffel Tower in the distance or the beautiful Musée d’Orsay just across the Seine. After a day of visiting museums and shopping, the peaceful Jardin du Palais Royal is a wonderful spot to rest. Surrounded on three sides by the arcaded buildings, the Palais Royal Gardens feel more intimate and private than the larger Tuileries Gardens nearby. After relaxing in the beautiful garden setting, explore the surrounding arcades lined with restaurants, art galleries and boutiques. The Place des Victoires is an elegant circle designed in the 17th-century by the well-known French architect Jules Hardouin-Mansart, the architect behind the splendor of Versailles. Situated on the border between the 1st and 2nd arrondissements, the Place del Victoires is located in an upscale neighborhood filled with shops by some of Paris’ top designers as well as boutiques by up and coming and cutting edge designers. Enjoy window shopping along the refined streets around Place des Victoires. Place Vendôme is one of the seats of elegance in the 1st arrondissement. This grand square is surrounded by 18th-century arcaded buildings and at the center stands the tall column built by Napoleon to celebrate the victory of the Battle of Austerlitz. For a taste of opulence, stop by the Ritz Hotel, where you can find Michelin starred restaurants and a wonderful bar to relax in. 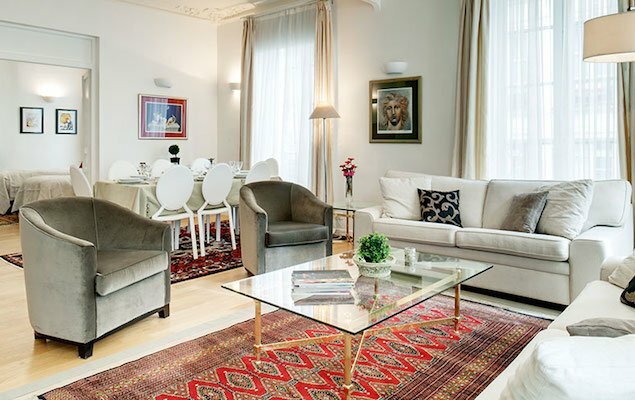 Staying in one of Paris Perfect’s luxury rental apartments near Place Vendôme, you can enjoy all of the perks of the neighborhood without breaking the bank with a stay at the Ritz. When you first look down rue Montorgeuil, only a few blocks from this Paris vacation apartment, is one of Paris’ oldest open air market streets, you’ll feel like you’ve stepped back in time. This pedestrian only street has a village setting and feel, despite the fact that it’s located right in the center of Paris. Walking up and down the street you’ll be tempted into some of Paris’ best meat, fish, fruit and vegetable, cheese and specialty food shops. There’s a lively air among the shopkeepers who often call out specials to the locals and tourists passing by. You’ll find everything you need for a marvelous lunch or dinner from foie gras, cheeses, fresh baked bread to wines and delightful displays of pastries for dessert. 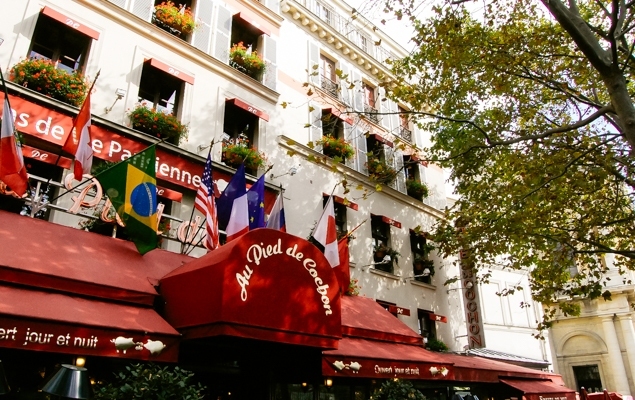 If you’re tired after a busy day of sightseeing, stop by one of the many delicatessens to pick out a gourmet dinner to enjoy in the comfort of your Paris Perfect apartment. Cooks will enjoy visiting all of the cooking and restaurant supply stores in the neighborhood, including the beautiful E. Dehillerin store at the corner of rue Jean- Jacques Rousseau and rue Coquillière. The 1st arrondissement is all about shopping! Elegant shops line the refined rue de Rivoli, while trendy boutiques fill the lively Les Halles quarter, making the 1st arrondissement is a paradise for Parisian fashion. Only in Paris can fashion, shopping and elegance be combined in such a fabulous way like the arcaded rue de Rivoli. Walking down the shop lined street, be prepared to find so many stores you won’t be able to visit them all in one day. And it doesn’t even end there, because then you have all the side streets to explore, which are filled with tons of original boutiques and fashion stores. Once described as “the belly of Paris” by Emile Zola, the Forum des Halles used to be Paris’ main market, selling fruits and vegetables for restaurants throughout the city. This area was transformed in the 70s into a multi-level underground shopping dominated by the curves of the modern glass and metal designed building. This popular shopping area features small boutiques and trendy, large chains as well as restaurants and cinemas. Above Les Halles is a wonderful pedestrian area with many open air cafés and bistros. Settle down at an outdoor table on a sunny day and you can sit out for hours and watch the world go by. 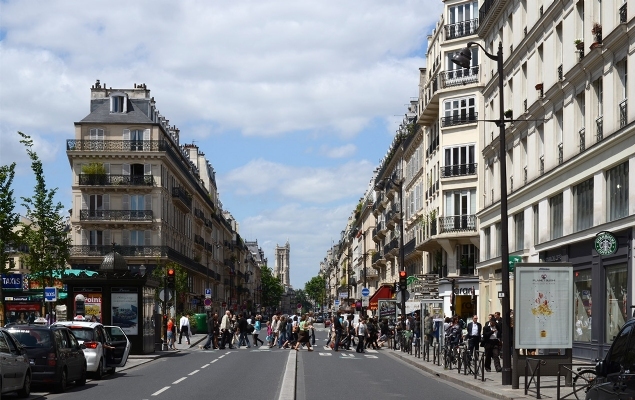 The 1st arrondissement is known for its wonderful shopping streets lined with fine restaurants and cafés. Stroll along the charming streets surrounding the St-Eustache Church and Les Halles on a sunny day and you’ll find the outside terraces full! The 1st is also famous for its Michelin-starred restaurants and celebrity chefs at Le Carré des Feuillants, Le Dali, L’Espadon, Le Grande Véfour and Pinxo.